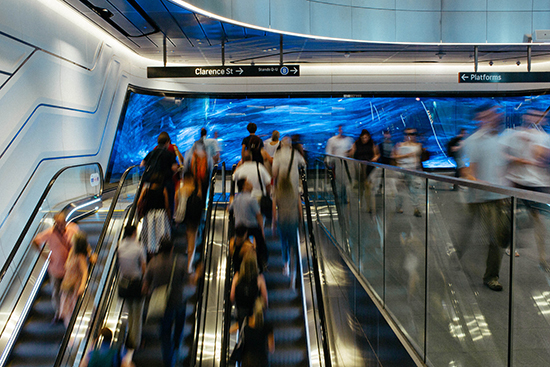 A mezzanined, underground thoroughfare connecting Sydney’s Wynyard Station and Clarence Street. Bordered by escalators, a softly curved LED screen sleekly wraps around the wall, tapering off into sharp corners. On it stretches a moving painting. Blue watery brushstrokes form the background to floating planes of smaller elements, like feathers or light coming through dust or through a window. This is the science fiction-like setting for a new urban screen for video art produced for TfNSW by Cultural Capital with curator Alessio Cavallaro. Launched in December last year, Wynscreen is timed to celebrate the 150th anniversary of Australia’s first railway station opened in Newcastle in 1866. In the coming months, the public art installation will feature commissioned artists James Price, Ross Gibson and Robyn Backen with Ian Hobbs. 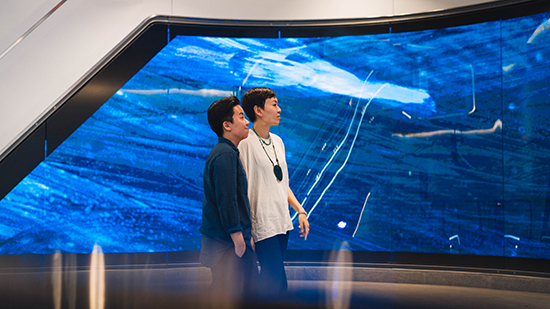 “Rail travel has influenced our lives directly,” says Beatrice Chew, of doeanddoe, the creative collaborators whose commissioned work Woven Moments currently graces Wynscreen. “Rail is not only about transporting us from A to B, it has altered our rhythm, our sense of space and how we experience time.” The works within the Wynscreen program all relate somehow to these ideas of moving through space: time, travel and place. Woven Moments brings two further ideas to that basic premise: that visual exposure to nature has an innately calming effect and quantum physics provides some visual ideas about how to abstract natural elements. The work joins Gary Deirmendjian’s Presence (also currently screening) and previously screened videos En Route by Sue Healey and Locomotion by the Lycette Bros, all on display for 30,000 passers-by daily. Beatrice Chew works in graphic and object design, Su-An Ng is an animator and their collaborator on Woven Moments is painter Michele Morcos. I spoke with Chew and Ng about the relationship between the content of their artwork and the context of its unusual exhibition space. How do you describe the work to someone who hasn’t seen it? Ng It’s a moving painting. It’s a mixture of drawn, digital and painted animation and paint on glass. Everything is hand-done, scanned or captured under the camera, animated and arranged digitally. People have said it’s like a galaxy or being underwater, and that’s totally right. You’re reminded of all these natural movements that exist, but it’s abstracted. Tell me about your idea of the relaxation response. Ng That idea came from the specific site the work is in. We wanted to create a work that is harmonious and pleasant. Chew [The work] is intentionally somewhat slow, because this is a hectic space for people to pass through. We wanted to make works related to health and science. This piece is very inspired by quantum physics, the theory that everything exists in particle and wave states. With nature, humans experience that as a relaxation mode. That’s why people go to the beach, that’s why they go on hikes. It has a natural mystifying impact on our wellbeing. This is a pretty heavy-impact area, and we’re hoping to see if even just five seconds of experiencing the video can relax them. How did you think about the shape of the screen and the content of the work? What were you thinking about in terms of the relationship between the borders of the screen and the architecture of the transit space? Ng [At the outset] it was really hard to imagine the feeling of the space, because everything wasn’t built yet. It was totally abstract. We had a rough sketch of the shape of the screen and dimensions of the space. Then we had two opportunities to test it and get it right; we just brought the file here with our hard-hats on to see if it worked. Until then we didn’t realise how much time you’d spend looking at the curves and angles of the screen; they are a huge focus. Immediately we picked that up and rejigged some of the elements. We also had to consider the negative space beyond the screen and between the screen edges. Chew Now I can’t imagine it not being curved. That’s a key feature. It becomes part of the space rather than a giant TV. How did you consider the ways people would encounter the work when moving through the space? 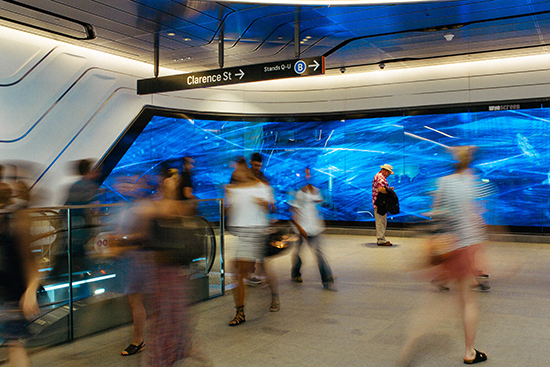 They see it first while either coming up or down an escalator, then they walk past this curved screen. What’s the relationship between the viewer’s body and that screen? Ng During rush hour, I stood upstairs and looked at people against the screen. You start to see there’s this relationship between the elements in the work and people moving through the space. In the first impression, you’re like ‘this is a cool piece of work,’ but for someone who wants to spend 10 minutes with it, there is a poetic relationship between the present space and the space in the work. Sometimes it’s as quick as someone turning their head to the screen. Chew In peak hour, in the afternoon, the way that people interact with the space is different. It could be that the work makes people feel comfortable—you often see them lingering in front of the screen on the phone or using it like a meeting place. I find that quite interesting because from a design perspective, this is a thoroughfare. So through their interactions, people become part of the work in a different way. So the video has changed the usage of the space in a way you wouldn’t expect. Chew We’re interested to see the other pieces in the program, to see how they affect the audience. Does it not matter what the work is? Do the other works change the space? Right, to see if the context and just the fact this project exists or the work itself is the main impact. Chew And should it be the work’s responsibility to make the space feel safer? I think there’s value in that. There are spaces in the city where I would not pass through or I would pass through very quickly. So how is a digital piece of work going to impact someone psychologically, how can it impact their experience positively rather than just be fancy wallpaper? So the job of the artwork changes substantially depending on its context and usage. And the work actually has a usage in this setting. Chew Yes. Sue Healey’s En Route was a dance film and this space became a stage. You’re attracting quite a different group of viewers from a gallery-attending audience. Did that affect how you approached the making of this work? Chew We’re of the view that people, including us (we live in the city), deserve beauty as well. There are events and things that our city is doing that are great to go to, but it’s nice to be part of something that is more permanent, that people can enjoy every day without going to a gallery. This is part of their life.